Sidney Crosby (87) on Sunday night after his team’s 3-1 victory over the San Jose Sharks to win the Stanley Cup. Crosby was named the M.V.P. of the postseason. SAN JOSE, Calif. — During the Stanley Cup playoffs, the Pittsburgh Penguins’ captain, Sidney Crosby, did not have as many goals or points as his teammate Phil Kessel. He had one fewer assist than another Pittsburgh center, Nick Bonino. He did not come out of nowhere to save the day like the rookie goaltender Matthew Murray. But when the Penguins defeated the San Jose Sharks, 3-1, to capture the Stanley Cup on Sunday night, it was Crosby who was named the winner of the Conn Smythe Trophy, which is given to the postseason’s most valuable player. 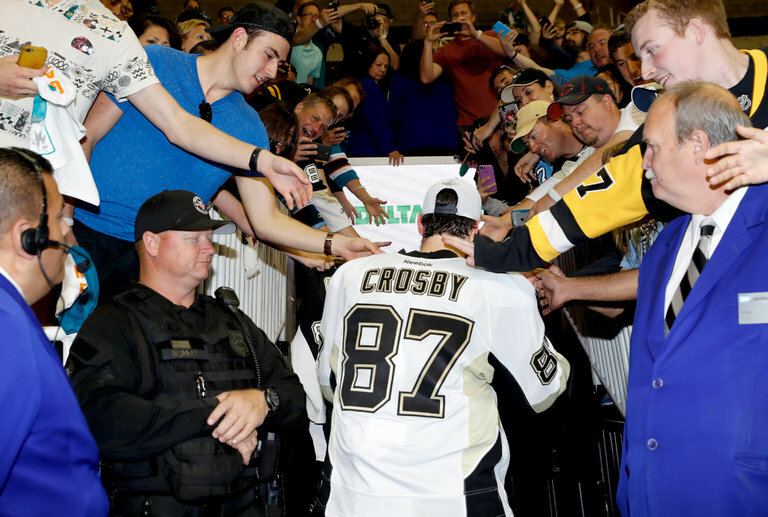 Nobody had to explain to those who played with Crosby why he was a deserving winner.